The sand dunes of Qatar are amazing. Since Qatar is located in the desert, there is certainly no shortage of them. Tour guides and trip advisors in Qatar have created all inclusive trip packages that might be just what you’re looking for. These trips up and down the sand dunes are exciting, you get to eat well prepared, home cooked meals, and the fun is unstoppable. 95 percent of the land in Qatar is simply barren desert. There is nothing for miles and miles. So, in an effort to generate some profits and show people the desert can be a really good time, people started taking trips out there in convoys. These convoys are made up of a group of vehicles that are designed to traverse the rough terrain. There is a lot of fun to be had on these trips, and if you are in the Qatar area, it should be first on your list for vacation attractions. 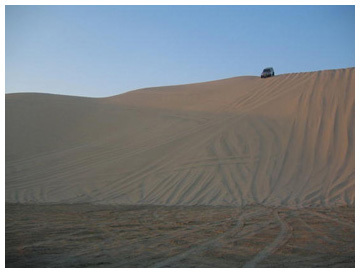 The Desert Safari is one of the most well known sand dune trips. More people comment and leave positive feedback about this trip than anywhere else. There are also camels you can make friends with and take rides on through the desert. Getting to see, first hand, how well camels do in the desert is amazing. There humps hold a surplus of water that makes it very easy for them to take extremely long hikes through the desert. There are plenty of car rentals to accommodate your need for a vehicle in Qatar, but most of them don’t insure off road trips. Just be sure to leave the car for the convoy when you are going to go out on the trip. The limestone outcrops in Bir Zekreet is a small village you can visit on your trips, and it is not to be missed. Did you know you can even ski in the sand? Yes, it’s true! While it is exhausting, it does provide quite an adrenaline rush. Temperatures reach around 106 degrees Fahrenheit during these trips, so be sure to pack clothes that are designed for the weather. And don’t worry about the vehicles! They were specially fitted to be good in sand. Even if they break down, you are not responsible for anything bad that happens on the trip. The drivers have years of experience, are friendly, and know how to have a good time. Trips can be booked in advance with the Desert Safari trip owners. You can also select multiple options to include on the trip like Extreme Driving/No Extreme Driving and whether or not to stay the night. There is a lot to see and do on the trips and I bet you will especially enjoy the food. They are master chefs! Enjoy your trip through the desert and remember to buckle up. The sand dunes are easy to drive on but can be dangerous if you hit a drift. There is a lot to learn about driving in the desert, so be prepared to learn a thing or two from these master drivers.